HomeInformasi yang harus Anda ketahuiSurgery for Liver Cancer: Eighty Percent Success? Blood test was positive for Hepatitis B. Liver function test indicated elevated liver enzymes – ALT = 101, AST = 43 and GGT = 107. Alpha-fetoprotein was normal at 4.84. 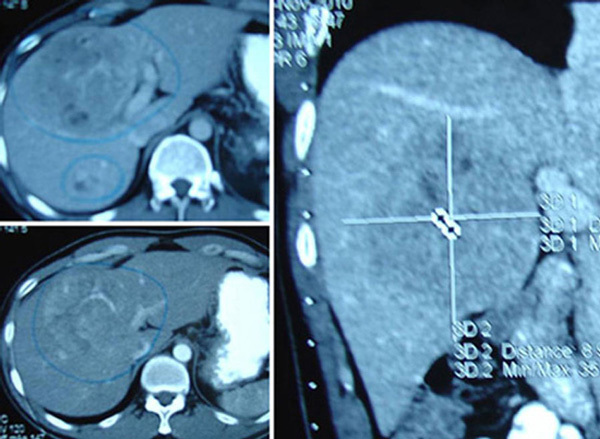 CT scan done on 12 November 2010 indicated a 8.2 x 7.2 cm mass suggestive of hepatoma in segment 8 of his liver. A small solid lesion is also found in segment 7 measuring 1.8 x 1.2 cm. This may represent a satellite lesion of hepatoma. A simple cyst is noted at segment 8 below the right hemidiaphragm. Wang went to see another doctor in another hospital. A repeat CT scan was done on 13 November 2010. The results were similar to the one done a day earlier. The surgeon suggested that Wang undergo surgery to remove the tumour. The operation would cost RM 40,000. After the operation, Wang would have to undergo chemotherapy. The cost of each chemo is around RM 4,000 to RM 5,000. Wang and his wife were disappointed and decided to go back to Medan without doing any surgery or chemotherapy. Someone learnt about their predicament and suggested that they come to CA Care for advice. We spent more than an hour with them. Below is a video recording of a part of our conversation that day. 1. Most of the story-telling was done by Wang’s wife. She only talks Chinese! It appears to me that she is a “smart and wise” lady even though she is not educated. 2. She said: “When the doctor (surgeon) said that my husband had to undergo surgery and chemotherapy, I knew that this is a serious case”. This shows that she is not a dumb, naïve village girl – never mind if she does not know how to read the CT scan report or figure out what the blood test shows. 3. I asked her: “Did you ask the doctor if surgery can cure his cancer.” She replied yes. Most patients who come to us did not do that! How could that be? They don’t even want to find out what the prognosis is like! Not this lady. 4. She even asked the doctor: “What if we do not do the chemotherapy?”. The surgeon replied: “It is like cutting the lallang. You need to apply chemical after you mow it down. Only then can it be eliminated.” The answer was right on spot because this lady works in the farm – she understood it well. To kill off the lallang you need to apply chemical poison. Sometimes the land had to be dug up or overturned to get rid of the rhizome. So she said: “Then what would that do to my husband?” The implication is – what would happen to the patient if you poison him like you poison the lallang? 6. I asked the lady: “The doctor said 80 percent success – did you believe him?” She replied NO. I asked her why. She said: “There is one statement that the doctor made which got stuck in my head. Earlier I asked the doctor about the risk involved – how certain was he that everything would turn out right.” The doctor replied this lady: “The same case like you flying in from Medan to Penang. The airline does not guarantee that you are risk free.” Though the doctor did not admit outright that the treatment has risk, his reply very much implies that there is risk – the lady got the answer. 7. Later in our conversation, I came to know that Wang’s sister also had liver cancer. She received chemotherapy. She died after four cycles. While many patients or their loved ones appear naïve – don’t under estimate them! They have gone through some bitter experiences in life and they are not about ready to forget them. For such people, doctors need to do a lot of convincing to make them accept chemotherapy again. 8. I feel sorry for this couple. They came all the way to Penang and had to spend so much money. They can do the treatment – no problem about that for as long as they can pay the hospital bills – but cure appears to be elusive. There is one important lesson we can learn from this story. How reliable or true are statements made by a doctor? Is it backed by good statistics and good research? At this point I am reminded of what some doctors wrote. Let me quote. It is not nice to say that doctors tell lies – but the above quotations seem to say that some do, though they represent a minority. But I must say I like what Dr. Hamilton said: “We generally don’t tell outright lies. We just don’t speak the truth fully.” In this story, the surgeon told Wang and his wife that the treatment has more than 80 percent success.” His answer can be dead right or dead wrong! Let me explain. From the perspective of this surgeon he is absolutely right to claim that the treatment has more than 80 percent success rate. A surgeon’s job is to cut up patients. After that he passes the patient to the oncologist or someone else. As far as he is concern his part of the cancer war is done. With the present state of the art technology, surgery carries minimal risk – like us flying in an air plane. The possibility of a crash is there but it is not likely (yes, it can happen!). Dying from surgery does occur although it is not likely. But is that what the patient is looking for – just not dying from surgery? From the perspective of Wang and his wife, they are looking for a cure of his cancer! To them, the answer of 80 percent success takes an entirely different meaning. Cure means completely elimination of the cancer and it will not come back. That is what all patients ask for. Therefore, if patients are made to believe that they can attain an 80 percent chance of cure if they undergo surgery or chemotherapy is definitely false. Let me repeat what Dr. Hamilton said: “we just don’t speak the truth fully.” Does this mean that doctors intentionally withhold some vital information which patients should know? If so, is that fair? I think the most vital information not told to patients is that though surgery is safe it will NOT cure the cancer. The chances of recurrence after an apparent successful surgery are very high. If you follow the case studies presented in this website, you will know that some patients die not long after their liver surgery. Perhaps is this the reason why Dr. Mendelsohn said we should regard doctors in general “with about the same degree of trust as used car salesmen”? In this article I have refrained from commenting if indeed the advice to operate is appropriate or otherwise. I would like to believe that the doctor has recommended this path with the best of intention. Even that, we need to be reminded that according to liver experts only 10 % to 30% of those who present with HCC are candidates for surgery. Meaning surgery is not the answer for all cases of liver cancer. Also surgery is good for only small tumours. Again, Dr. Mendelsohn’s words come to mind, they do this “because surgeon gets paid when he performs surgery on you”. Let me conclude this article by trying to answer my earlier question: to what extent is the statement “after surgery there is a more than 80 percent success” true. I spent time reading my oncology books again. Below are the scientific facts written by liver experts. Read them carefully and come to your own conclusions. Ikeda et al., Cancer, 71:19-251993, reported: Eighty-three patients with HCC were treated with curative surgical resection during the past 8 years. No operative deaths occurred. Recurrence rates after resection at the ends of years 1, 2, and 3 were 37.0%, 57.1%, and 71.6%, respectively. Iwatsuki et al., Ann Surg. 1991 September; 214(3): 221–229, reported: From 1980 to 1989, 76 patients with HCC underwent subtotal hepatic resection. Only 12 patients lived more than 5 years. Vauthey, et al., American J of Surgery; Vol: 169, pg. 28-35, 1995, reported: Between 1970 and 1992, 106 patients underwent hepatic resection for HCC at Memorial Sloan-Kettering Cancer Center.Overall survival was 41% and 32% at 5 and 10 years, respectively. Nagao et al., Ann Surg. 205(1): 33–40; 1987 reported: Ninety-four patients underwent hepatic resections from 1963 to 1985.One-, 3 and 5-year survival rates were 73%, 42% and 25% respectively. The recurrence of carcinoma was the main cause of death in 56% (42 patients) who died after discharge from the hospital. Prognostic factors that influenced the long-term prognosis were: preoperative alpha-fetoprotein level (less than or equal to 200 vs. greater than 200 ng/mL), tumor size (less than or equal to 5 vs. greater than 5 cm), and tumor capsule. Shyh-Chuan Jwo, et al. Hepatology , Vol. 1367–1371; 1992 reported: A total of 238 patients who received curative hepatic resections during the last 10 years were observed. The results revealed that tumor size, tumor appearance and DNA ploidy were the factors in predicting tumor recurrence after resection for HCC. Patients with a tumor size less than or equal to 5 cm or a tumor appearance of the solitary type had better disease-free survival than did those with a tumor size greater than 5 cm or a tumor appearance of multiple/daughter nodule types. HCC is notorious for poor prognosis because of its invasiveness and frequent association with cirrhosis. Hepatic resection remains the treatment of choice for HCC. During the past decade, hepatic surgeons have focused much effort on improving the surgical techniques and perioperative management for resection of HCC, resulting in greatly improved perioperative outcomes. By the end of the 1990s, studies from our institution and others have demonstrated that a zero hospital or surgical death rate could be achieved in large series of patients. Long-term prognosis after resection of HCC remains unsatisfactory. Disease-free survival has been poor because of a high incidence of recurrence. A 5-year cumulative recurrence rate of 80% to 100% has been reported. Reports in the 1990s from Eastern and Western centers have documented a 5-year overall survival rate of 26% to 44% after resection of HCC. Harrison’s Principles of Internal Medicine 15th Ed., pg.589. Staging of HCC is based on tumour size, ascites (present or absent), bilirubin and albumin. If untreated, most patients die within 3 to 6 months of diagnosis. If detected very early, survival is 1 to 2 years after resection. Surgical resection offers the only chance for cure, however, few patients have a resectable tumour at the time of presentation because of underlying cirrhosis or distant metastases. Radomised trials have not shown a survival advantage after chemoembolization. Liver cannot tolerate high doses of radiation. The American Cancer Society’s Clinical Oncology, 3rd Ed., pg. 399-401. Only 15% to 30% of patients with HCC are candidates for surgery. Conditions that render HCC unresectable are extensive disease within the organ itself and metastases. Large tumour size, bilobar involvement and presence of cirrhosis do not necessary preclude resection but adversely affect mortality and prognosis. Resection generally is limited to patients with small peripheral lesions and preserved hepatic function. Five-year cure rate for all HCC who have undergone hepatic resection is approximately 30%. The value of radiotherapy is limited in treating HCC. Chemotherapy is palliative. Patients who respond to chemotherapy will survive 9 to 12 months longer. Mean survival for patients receiving chemotherapy is approximately 5 months (1- year survival is 27%, 2-year is 8%). Cure and long-term survival are possible only when tumours can be resected completely. Martin Abeloff, et al. Clinical Oncology, Vol: 2, pg. 1697, 1703-1721. Median survival of Hong Kong patients with inoperable HCC – tumour larger than 6 cm in diameter and receiving no treatment – was 3.5 weeks. Tumour size at diagnosis is an important prognostic variable. Tumour doubling time ranged from 1 to 19.5 months, with an average of 6.5 months. Study in Japan showed that for patients with cirrhosis and HCC less than 3 cm in diameter and without treatment, 1-year survival rate was 90.7%; 2-year was 55.0%; and 3-year was 12.8%. Unfortunately only 10 to 15% of newly diagnosed HCC patients are candidate for resection. Presence of cirrhosis is a negative prognostic indicator. Operative mortality rate of liver resections for HCC is les than 10%, but post-operative morbidity rate remains high – between 40 to 60%. 85% of hepatic recurrences develop within 2 years of resection. There is little evidence of significant therapeutic activity for any single chemo-agent. There is also no evidence to support the routine use of combination chemotherapy.